Did you know you can now order your Deliveroo takeaway from Jackson and Rye here on View? Jackson and Rye is a stylish restaurant and bar offering American meals from breakfast through to dinner, with brunch available at the weekends. There is also an intimate cocktail bar at Jackson and Rye with drinks following the American theme. 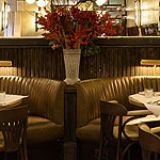 Do you work at Jackson and Rye? What did you think of Jackson and Rye? 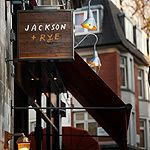 In the heart of Soho lies the latest buzzing restaurant to be inspired by the great American tradition, Jackson and Rye. With the support of Richard Caring and the successful team of Hannah Bass and Mark Askew, this lively spot is sure to become a new favourite for all day meals, excellent cocktails and good ol’ fashion Americana. Dark wood and a wonderfully designed bar area greet diners upon entering. 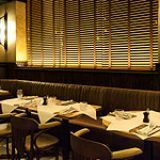 The space is dimly lit in a way that is reminiscent of old-time American bars, with long tables and corner booths typical of the Western tradition. 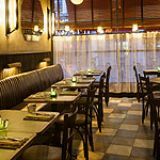 The location on Wardour Street makes this cosy nook very accessible and very central. The smooth, near-jazz atmosphere of the restaurant can be felt throughout. It is not too hard to imagine the staff on the stereotypical roller-skates seen in the diners of yesteryear, with the speed of delivery and friendly attitude being very welcome. The menu is a shopping list of American greats, from corn grits to steaks and lobster. There is almost certainly something to please a US cuisine aficionado, and definitely something to try for those looking for something new. A classic favourite with a twist, the truffled mac and cheese with rocket and parmesan (£6.95) is everything you might expect. Truffle oil and mushrooms add a distinctive tang to this typical American fare. The crab with avocado and spiced tomato sauce (£7.95) is equally delicious, with the flavours melding well. The mains also impress, with the gnocchi accompanied by wild mushrooms, leeks, rocket and parmesan (£10.95) prepared to perfection. The rib cut, grain fed, rib-eye steak (£18.95) is absolutely mouth watering, practically melting in the mouth. The special sauce lives up to its name, being a spicier, richer version of barbeque sauce. The chips (or as they call them across the pond, fries) are fantastically crisp, too. Desserts are a medley of classics, but the peanut butter cookies with milk ice cream and chocolate sauce are not to be missed. The jam centres of each cookie are a great touch. The pecan pie (£5.95), ever featured in American lore, comes with rye ice cream and is very tasty. The wine list ranges across the States and winds its way through all the other world continents, but the strong red Gnarly Head 2012 from Petite Syrah in California (£34.50) is full of vim and spice. The cocktail list has some excellent examples on offer, with typical drinks such as an Old Fashioned (£8) amongst some more unfamiliar types such as the Floradora, Deuce Royale and Breakfast Sour. 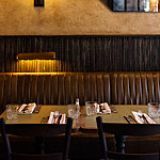 Sure to become a staple of the Soho restaurant scene, Jackson and Rye is perfect for a friendly dining atmosphere and undeniably great food. Be sure to practice your American twang and tuck in to as much of the menu as you can afford.